Why Choose Fluoride Varnish for Preventative Dental Care? Preventative dental care is of the utmost importance for ensuring oral health. There are a number of solutions Dr. Joy M. Miller employs to improve dental health. One of the most effective is fluoride varnish. There are a number of reasons that we encourage the use of fluoride varnish. If you watch TV or movies, you may notice that the people who appear on programs or films have one thing in common: shiny white teeth. You may ask yourself, “How can my teeth look like that?” After all, there’s no better way to present yourself to the world than with a perfect smile. 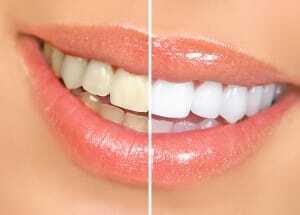 The simple answer is that many Hollywood celebrities use professional tooth whitening services. What should I consider when I pursue tooth whitening? While the allure of a cinema-worthy smile may be enough to get some people to scramble toward the dentist without another thought, others may wonder about tooth whitening’s safety. It is very safe when provided by and supervised by a dentist. If you choose to visit a dentist for whitening, you can rest assured that he or she has the professional knowledge and skills to get the job done safely and correctly. What about tooth whitening for my kids? A perfectly white smile may not be top priority for your kids. If your children are concerned about the color of their teeth, the best thing to do is to consult with your dentist. If all of the permanent teeth have erupted, it is possible that whitening may be a treatment option for them. The staff at the dental office of Joy M. Miller, DDS are experts in oral care, including teeth whitening. For more information or to schedule an appointment, contact us online or call (816) 452-5800 today. Fluoride in Your Drinking Water: Good or Bad? We have all heard the benefits of drinking water to our muscles, brain, or bones, but have you ever considered the benefits to your oral health? Fluoride is a natural mineral which can be found in food and water. Fluoride in drinking water has become one of the most helpful ways in reducing tooth decay over the last several decades. It helps prevent cavities by helping with the hardening of enamel in baby and adult teeth. Fluoridation in community water systems is a safe and easy way to improve the oral health of millions of people. “The Centers for Disease Control and Prevention has proclaimed community water fluoridation as one of 10 great public health achievements of the 20th century.” There are communities with no fluoridation systems; however, your dentist can give you information on ways to add fluoride to your daily routine. You should check with the local water district to see if your water supply is fluoridated as fluoridation is essential to the prevention of tooth decay. In fact, a lifetime of water that has been fluoridated cost less than a single dental filling. To add to the long list of all the ways water is beneficial to your body, now you can think about the benefits to your teeth when you take drink. “Today, studies prove water fluoridation continues to be effective in reducing tooth decay by 20 – 40%, even in an era with widespread availability of fluoride from other sources, such as fluoride toothpaste.” Just by drinking water, you are giving your teeth the single most important way to fighting tooth decay! Have you ever had a conversation with someone only to realize immediately afterwards that your breath smells terrible? You have brushed, flossed, rinsed, and your breath still stinks! Have you ever found yourself with this embarrassing problem? Over 80% of bad breath originates in the mouth. There are millions of bacteria on your tongue that cannot be brushed off with your toothbrush. The deep grooves and hair like projections on your tongue, known as papillae, also hold food particles. Imagine last night’s dinner, sitting in a moist environment at 98.6 degrees for 8-12 hours. It’s going to smell bad! Most everyone knows the importance of brushing, flossing, and proper dental for maintaining oral health. A tongue scraper is a necessary tool in the fight against plaque, bacteria, and bad breath! You cannot get a clean tongue by brushing it with a toothbrush. A toothbrush is made to clean the harder, solid structure of your teeth and gums. Your tongue is soft and squishy. The tongue scraper gently lifts and removes odor causing debris and bacteria from the grooves of your tongue. Daily tongue scraping is key to fresh breath! Your dentist or hygienist will be happy to demonstrate proper oral hygiene including tongue scraping for you. Don’t rely on mouthwash, gum, or mints to just cover up your bad breath. Eliminate bad breath with this easy technique! It’s Halloween night and your little candy cruncher has laid out his or her Halloween candy all over the floor. You, of course, take some of your favorites because he doesn’t need all that candy. You deserve it after walking all those blocks in the freezing cold drizzle! I’m going to tell you one of the scariest things about Halloween. Sugar mixed with the bacteria in your mouth produces acid. This acid attacks your teeth for up to 20 minutes. If you are snacking on Halloween candy several times a day for several days…the effect on teeth can be dramatic! The number of times per day teeth are exposed to sugar should be limited. Ten pieces of candy in ten minutes is better than one piece of candy every day for 10 days because of less acid exposure to the enamel. The following might not seem like a good idea for your little monster’s belly but it works well for their teeth. Give them free reign with the candy sack for one or two days then get rid of the rest. If you need a place to donate it, your local dental office would be happy to take it! Call Joy M. Miller D.D.S. 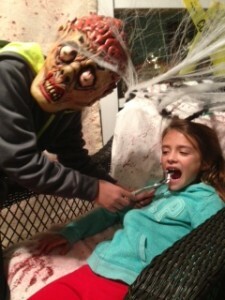 dental office at (816) 452-5800 to schedule an appointment after your Halloween adventures. Welcome to our new website! Please check back for regular updates.